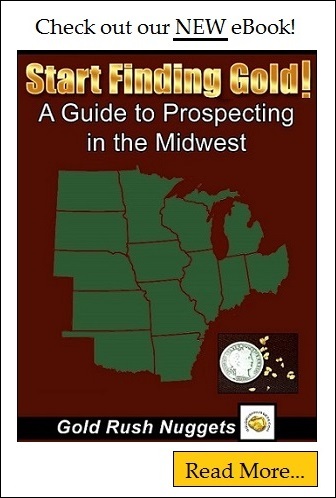 Where to Pan for Gold in Illinois. Find Gold. Gold has not been found in sizable quantities in Illinois. Even as a byproduct of other types of mining there are limited reports of any significant amounts of gold being recovered. Nonetheless, Illinois is like many of its neighboring states that have been blessed with at least limited amounts of placer gold deposits in the form of past glacial drifts. Thousands of years ago, glaciers that moved southward from Canada carried richer gravels that contained gold. As these glaciers slowly receded, they dropped these gravels into many of the eastern states in the US, including Illinois. These deposits are generally scattered throughout large areas, and do not accumulate in quantities that are economically feasible for mining, but do provide recreational prospecting opportunities for gold seekers. A few areas with reported gold occurrences are listed below. In Macon County, the Sangamon River and its tributaries have some gold. Fulton County produces fine gold in the Illinois and Spoon Rivers. The Vermillion River in Ford County has produced small amounts of gold in the past. The Embarrass River in Jasper County has also produced some placer gold. In Wabash County, the Wabash River and tributaries have fine gold. As stated earlier, the gold occurrences in Illinois are limited to glacial deposits, which generally are not rich enough for any profitable venture. Recreational miners may have success in the areas listed above, or any other stream within the area of glacial drift. Be aware that Illinois has some quite restrictive regulations in certain areas, especially on state lands, so be sure to contact the appropriate agency to ensure you are legal.